For all the veggie rainbow fans out there, I’ve got another recipe coming at you today. 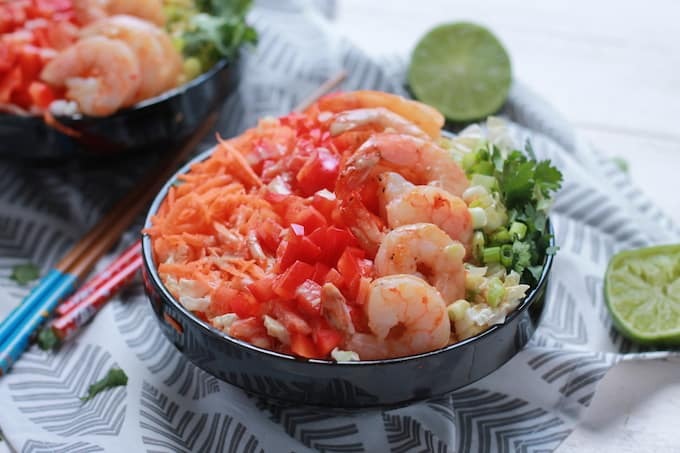 These Thai-inspired Asian Shrimp and Rainbow Slaw Bowls are overflowing with cabbage, carrots, bell pepper, and fresh cilantro, topped with chili garlic roasted shrimp and tossed in a light peanut dressing. This salad is all kinds of healthy and it will fill you up thanks to all those colorful veggies. I’m a fan of huge portions so my trick with salads is to really load them up with mounds of the lettuce, greens, or cabbage base and pile on the fresh veggies. Then, I use just enough dressing to lightly coat all that healthy goodness! It’s a great way to bulk up your meal and increase the portion size. The shrimp was the easiest part of the recipe because it literally takes 1 minute to coat them in the chili garlic sauce and 5 minutes to roast them. Instead of roasting, you could even throw them on the grill. Another idea? 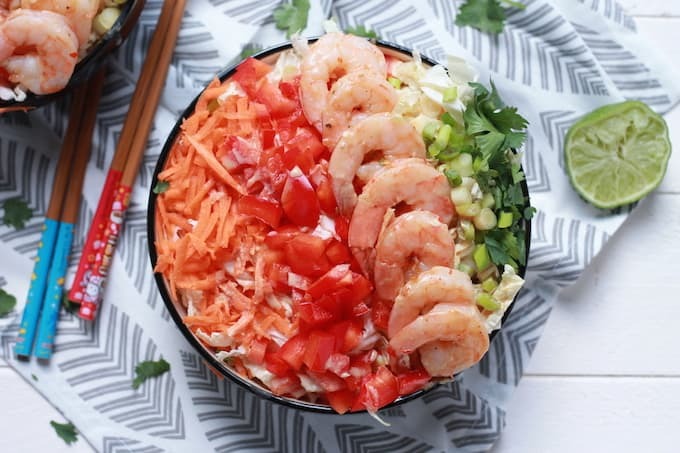 Skip the shrimp and use another fave protein! Steak, tofu, pork…or the slow cooker teriyaki chicken from this warm Asian slaw recipe would also be a superb option. And to bring all the veggies and protein together, I made a quick peanut dressing. For the base, I turned to my beloved PB2 powder. But feel free to use the real stuff or any nut butter. Then, I livened it up with tangy lime juice, honey, and soy sauce. If you’re feeling the rainbow veggie love in this recipe, make sure you Yum it! Look for the little orange Yum button at the end of this post. It’s next to the other social media sharing buttons. Clicking this button will take you to Yummly, the fastest growing food site, curated with mouth-watering recipes from all over the web. Set up a personal recipe box and explore (and Yum) recipes according to your taste, the ingredients you have on hand, and dietary needs. Once you Yum your fave recipes, organize them into collections and use the Yummly app to generate a grocery shopping list! Find out more about how Yummly works here! And visit my Yummly page to Yum all of your favorite Destination Delish recipes! Place shrimp on a plate lined with paper towel. Pat the shrimp dry with another paper towel. Sprinkle salt and pepper on shrimp and add them to a large bowl. Add in the chili garlic sauce and olive oil. Toss to evenly coat. 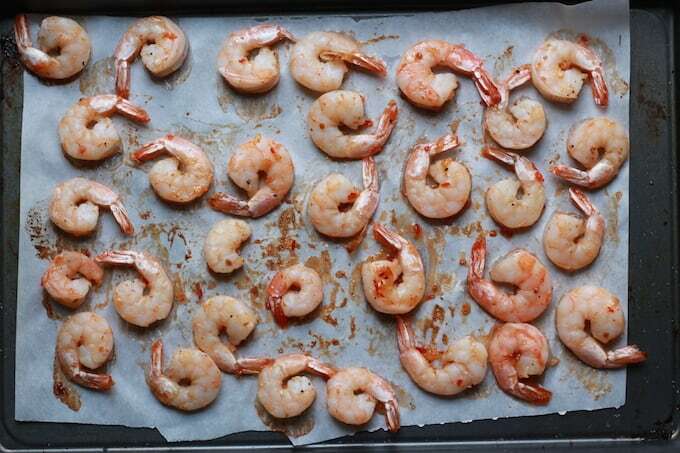 Spread the shrimp out on a large lined baking sheet. Bake in the oven for about 5 minutes until the shrimp are pink and cooked through. Set shrimp aside. Combine all peanut sauce ingredients in a small dish. Using a fork, quickly stir until the mixture is creamy. Set aside. 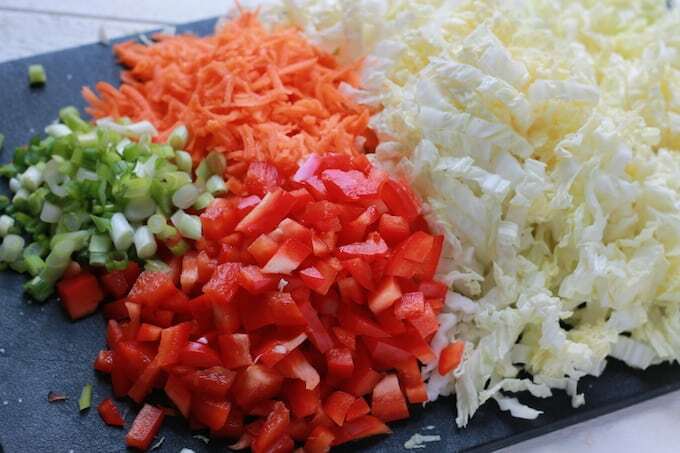 Place equal amounts of cabbage, bell pepper, carrots, and green onion into 4 bowls. 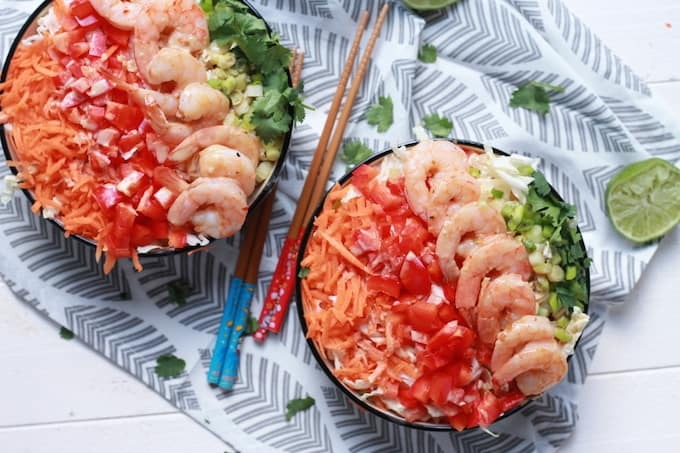 Top each bowl with 7-8 shrimp and 2 tbs of peanut sauce. Top each bowl with a sprinkle of fresh cilantro.